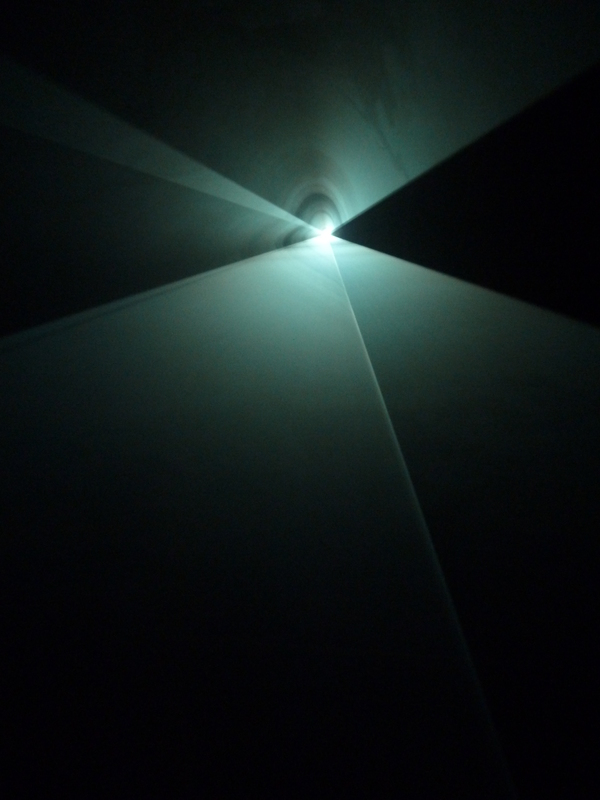 I have fond memories of the two recent light exhibitions in London – Anthony McCall and James Turrell. 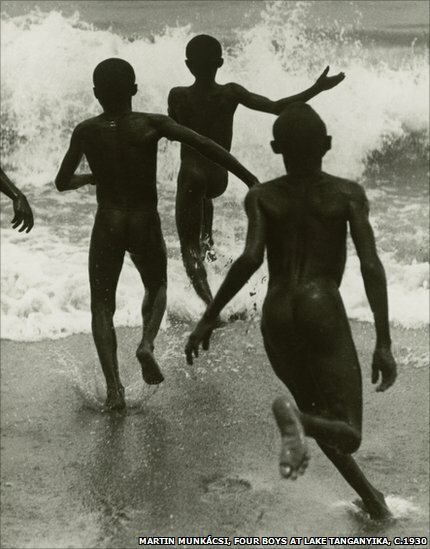 Maybe they were so impressive as concentrated explorations of work by individual artists. Maybe they were just good exhibitions. Light Show at the Hayward did not leave me feeling so warm. I know I’m in the minority here and I have no doubt that many of you will disagree with me but I found the show bland and, in parts, facile. 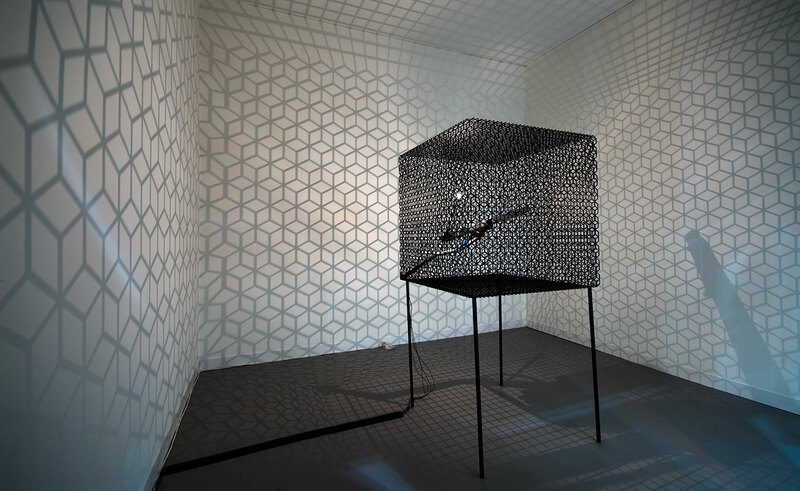 Conrad Shawcross, Slow Arc Inside a Cube IV, 2009. Image via www.endoftheline.co. 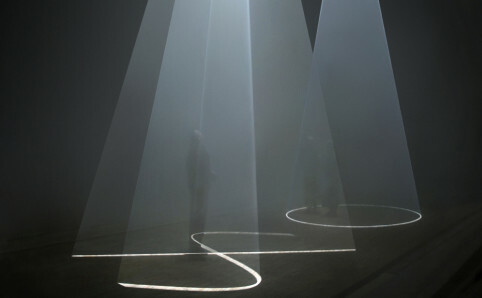 The exhibition examines light’s potential as a sculptural medium. What I find to be more fascinating is how we couldn’t manage without light and this becomes apparent as we struggle to find our way in and out of some of the installations. Light has always been at the forefront of science, technology and art and the exhibition makes use of the whole spectrum from a standard light bulb to cinema projectors with fabulous uses of technology and special effects. 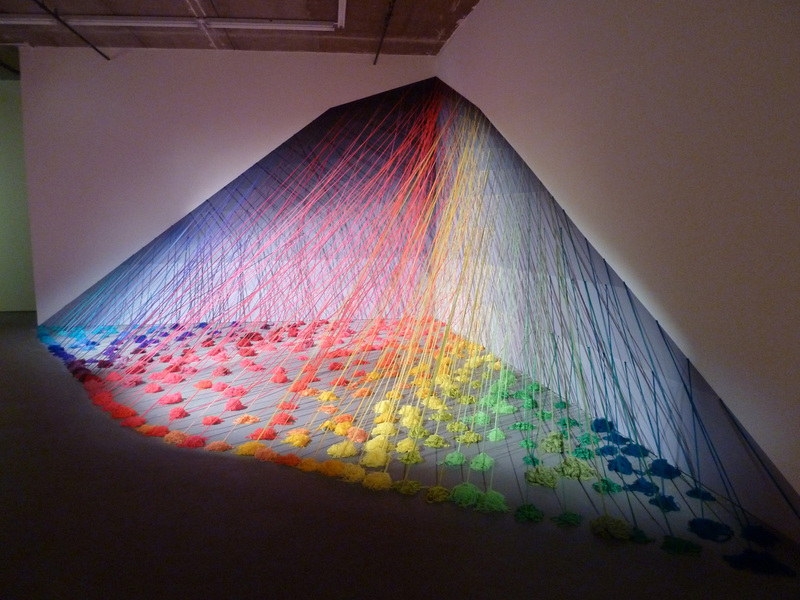 The work varies from small pieces to huge installations where you lose yourself and enter another world. 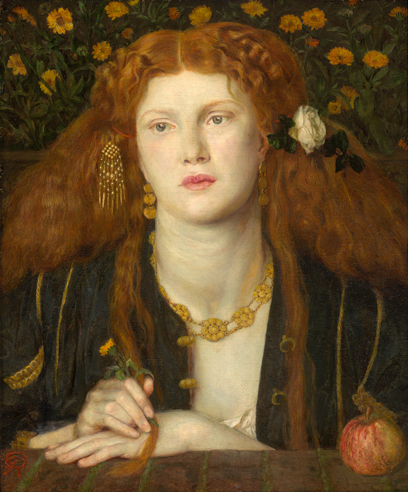 Famous works are seen alongside pieces that have never before been exhibited in the UK. 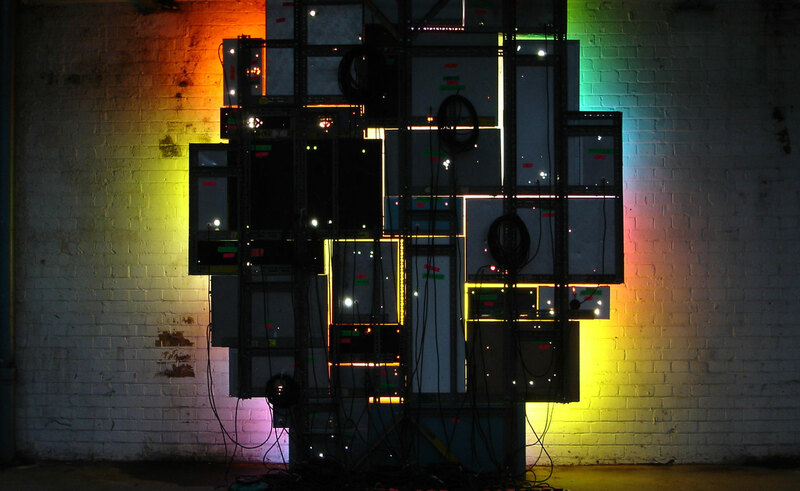 David Batchelor, Magic House, 2004/7. Image via www.haywardlightshow.co.uk. The brutalist architecture of the Hayward is, in theory, the perfect setting for this. The lack of windows means that light can be used to totally transform the space but the density of works means that the Hayward haven’t taken enough advantage of their daylight-deprived space. 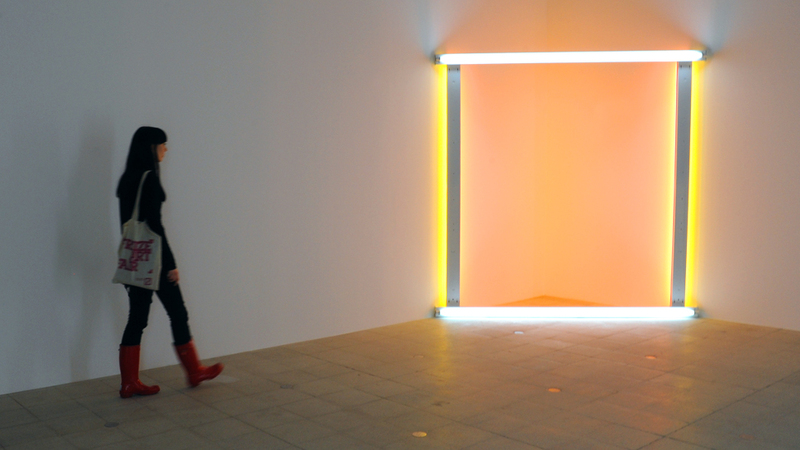 Dan Flavin, the founder of light art, began this pioneering movement in 1961. His work is found upstairs, combining daylight, yellow and pink fluorescent tubes. But the gallery is too infused with light from other works for this to be effective. The work needs more dark space and this is a problem throughout. What is amazing is to be able to look back to the 1960s and see how our control of this media has developed and how artists have embraced new technologies in inventive ways. Dan Flavin, untitled (to the “innovator” of Wheeling Peachblow), 1966-68. Image via www.bbc.co.uk. The exhibition opens with a work by Leo Villareal that is hypnotic to watch. Random patterns, operated by complex computer programming, cascade in endlessly changing waves evoking fireworks, waterfalls and the like. The speed is constantly in flux; the patterns morph from gentle twinkling to fast scatterings in a unique design where the same sequence will never be seen more than once. Leo Villareal, Cylinder, 2011. Image via www.onestoparts.com. Cerith Wyn Evans’ columns in the second room make us think about electricity, light and energy as living things; consisting of floor-to-ceiling columns that ‘breathe’ giving off heat, brightening and dimming and affecting the surrounding space. The changing colours in Carlo Cruz-Diez’s work are marvellous. This is a specially made optical environment where the three colour chambers (red, green and blue) dazzle and appear to change colour before your very eyes. Since the retina usually perceives a wide range of colours simultaneously, experiencing these monochromatic situations causes visual disturbances. I thought this was great but I’m reliably told it’s not a patch on his installation at MoMA. Many of the works illustrate how light affects mood and the sensory overload here was very moving. This was one of the works that required visitors to scramble around putting on overshoes, causing a hold up and just an altogether unpleasant experience. 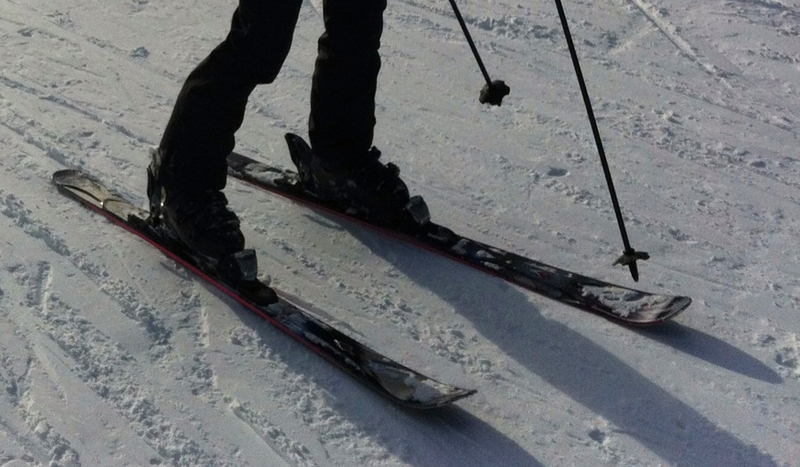 Stilettos and overshoes are not a good combination. 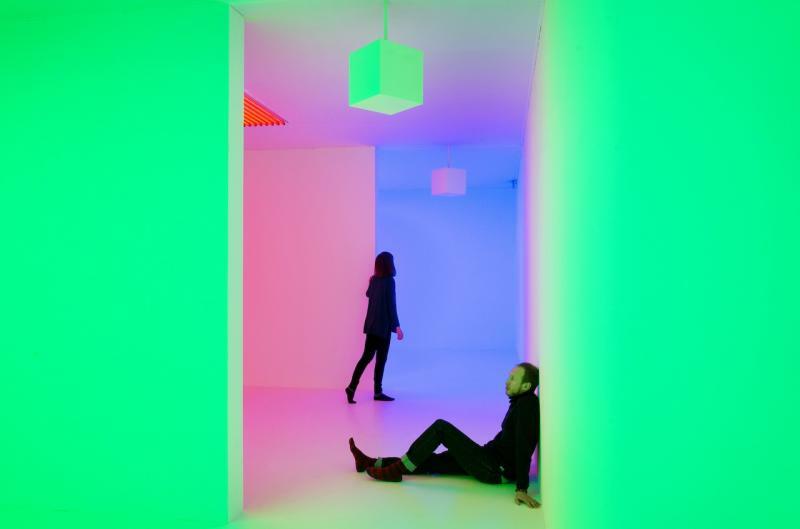 Carlos Cruz-Diez, Chromosaturation, 1965-2008. Image via www.theartsdesk.com. I decided to queue for the Turrell piece but, for me, this was one of his weaker works. 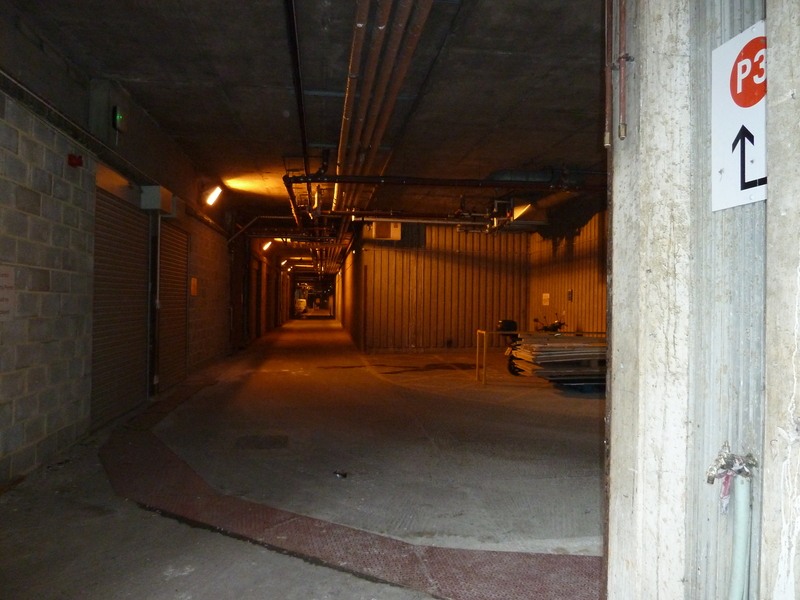 Stumbling down the dark corridor we are guided to sit down in a pitch black room containing a full height proscenium. Beyond is another room but it’s hard to fully understand what we’re looking at. 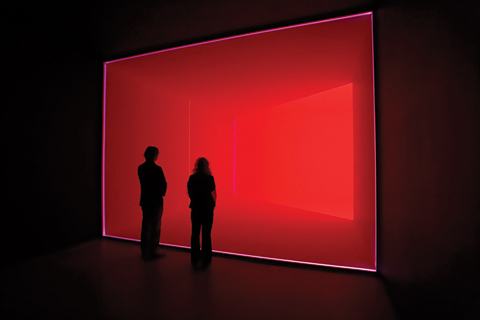 Turrell began this series of work in 1969, using light to diagonally divide the space in a room, creating what seem like tangible shapes. The longer we spend here, the more we see as shadowy apparitions and random twinkles appear. Perhaps I wasn’t prepared to stay long enough for the work’s full effects to reveal themselves but I felt let-down. In fact, from the looks on people’s faces as they left this work I’d say that I wasn’t alone. James Turrell, Wedgework V, 1974. Image via http://tobelikeafeatherby.wordpress.com/. Upstairs was far weaker and it felt as if the curators were trying to cram works in without much thought of harmony and juxtaposition. I didn’t queue to go into the Tardis-like piece where illuminated space expands around you (your reflection never appears) and beneath your feet is a plunging black abyss. The illusion is created by one-way mirrors, like those used in interrogation rooms. Most visitors seemed to be missing the political undertones at play with this work; they were cooing at the pretty lights, when, in fact, the work attempts to recall a torture chamber associated with the artist’s own experience of the control and repression in Pinochet’s Chile. 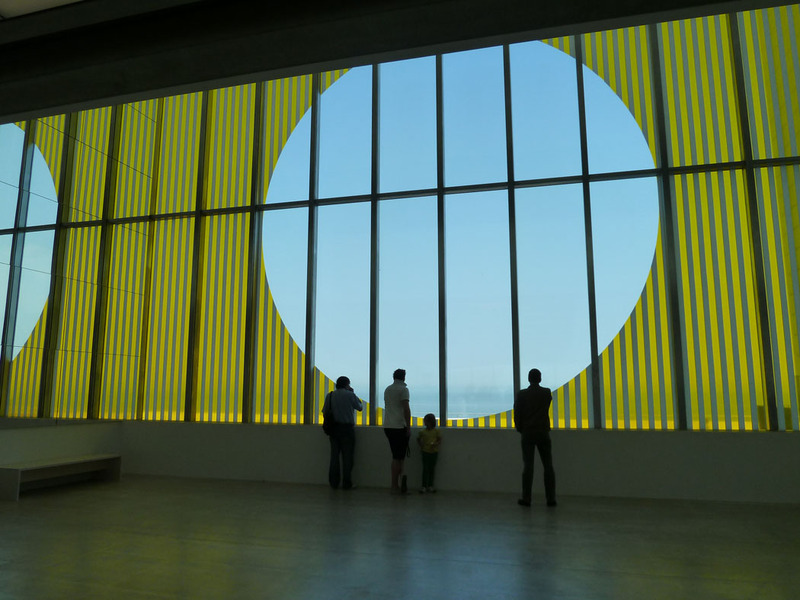 For me, the best work was Olafur Eliasson’s piece. In a pitch black room we see jets of gushing water illuminated by fast-flashing strobe lights. It takes a while for your eyes to adapt but, when they do, this is magical. 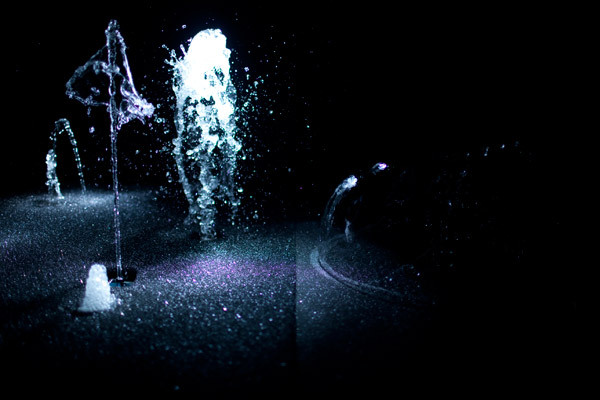 When a strobe light is used to illuminate flowing streams of water, the cascade appears as individual droplets of liquid and, by adjusting the frequency of the strobe, the droplets appear to freeze in mid-air. Olafur Eliasson, Model for a timeless garden, 2011. Image via www.newscientist.com. I think the most disappointing was McCall’s work which lost all its power in such a small space. 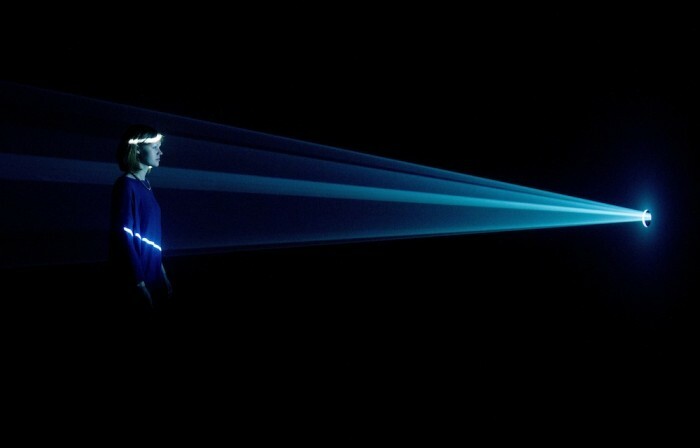 This is a horizontal light film, working on the same principles as the vertical structures we saw at Ambika P3, with a video projector, haze machine and computer scripting creating a large light sculpture that can be explored. Where was the magic, the intrigue and the delight that I had experienced there? Last time, I saw McCall’s works I felt my whole body being affected and I remember describing the sensation of losing myself in the light. That certainly didn’t happen this time round. 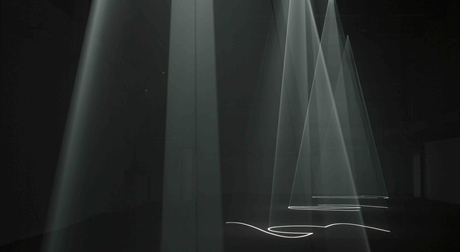 Anthony McCall, You and I, Horizontal, 2005. Image via www.artwednesday.com. I could see nothing worthwhile in most of the pieces. It’s an exhibition all about experience and entertainment. 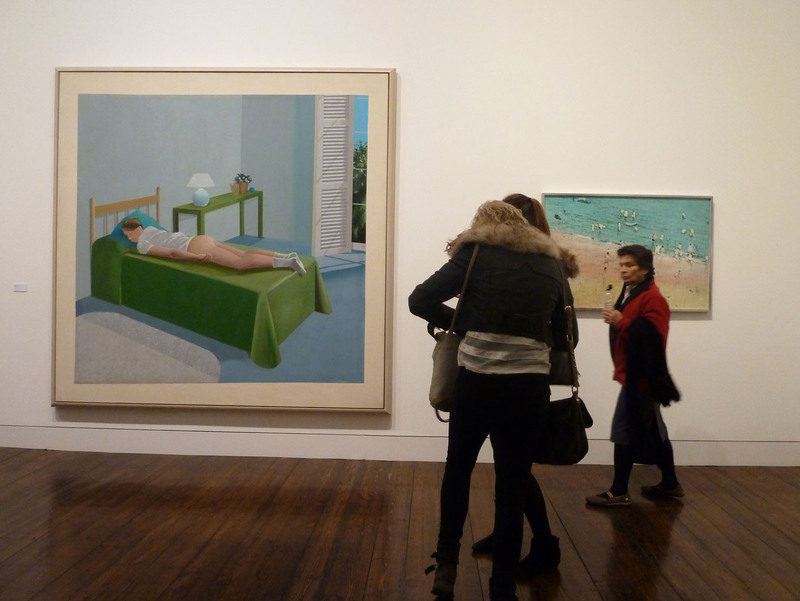 Although the exhibition guide and catalogue are fascinating and elucidate many of the works, people are missing the point and coming into the Hayward to play. There are no related works and no preparatory studies. But, I can’t criticise the Hayward for what they have set out to do – simply called Light Show it isn’t pretending to do anything complex. I just don’t think this is worth the hype and I came away disappointed. It’s a bit like walking round a theme park of special effects. Some of these pieces that I have no doubt would be sublime in isolation lose something here. It’s not quite the sensory journey I expected – it’s so hit and miss. Light Show is at the Hayward Gallery until 28th April 2013, www.southbankcentre.co.uk. Sylvia Plath is one of the literary greats from the 20th century. Married to Poet Laureate, Ted Hughes, Plath tragically committed suicide at the age of 30. The themes of her work, with its often-alarming frankness and confessional nature, came to influence an entire generation of artists and writers. Plath’s renown stems mostly from her poetry, rather than her art. 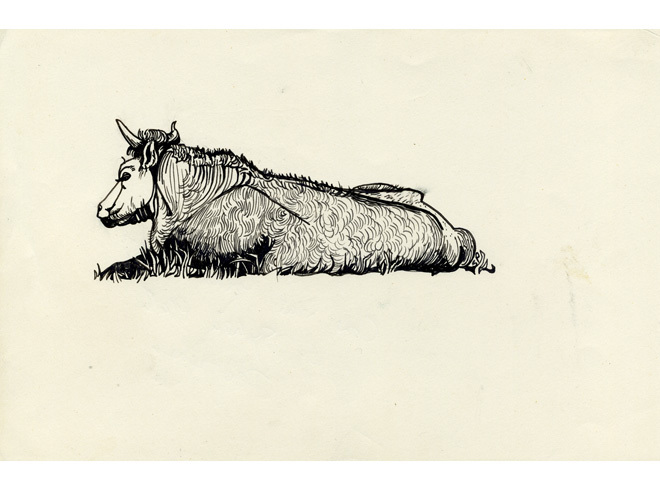 Sylvia Plath, Bull near Grantchester, 1956. Image via www.mayorgallery.com. 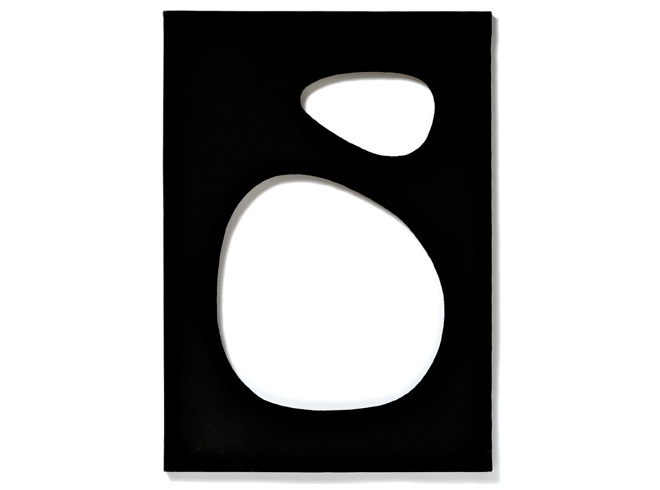 The Mayor Gallery are showing 44 never-before exhibited drawings by Plath, accompanied by an exhibition of 18 works by Dadamaino, one of the key artists of the Zero Group, characteristic of her style: cut-out monochromatic canvases and stretched, perforated plastic works. Dadamaino, Volume, 1959. Image via www.mayorgallery.com. 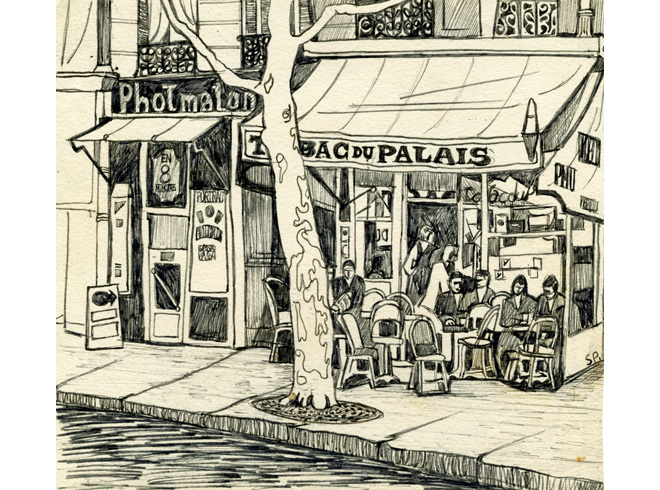 Plath travelled in Europe and recorded it all through keenly observed drawings, many of from her time in Paris. These carefully constructed pen and ink drawings depict a relatively serene world where Plath seems to have enjoyed natural beauty and stillness, finding incredible harmony and precision in the everyday. There is a childish simplicity here that is certainly never evident in her writing. The drawings have an incredible feeling of purity with no trace of despair. They are not to be over-analysed but should be looked at in contrast to her written works; they take the form of escapism, showing a happier side to her character. Sylvia Plath, Tabac Opposite Palais de Justice, 1956. Image via www.mayorgallery.com. Art had always been important to Plath and she received private tuition as a teenager. The drawings focus on an art form that gave her pleasure and inspiration. It was a form of passion that allowed her to flourish in a positive way in contrast to her decline into mental illness. 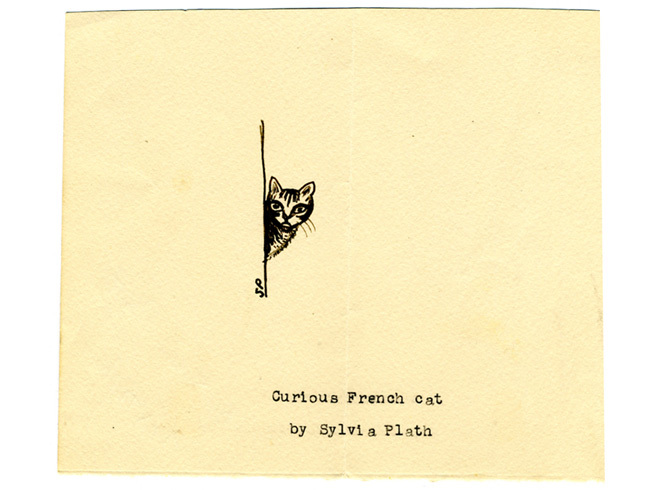 Sylvia Plath, Curious French Cat, 1956. Image via www.mayorgallery.com. Her early letters, diary notes and poems were often heavily decorated, and she hoped her drawings would illustrate the articles and stories that she wrote for publication. Ted Hughes mentioned Plath’s art in his last collection of poems, Birthday Letters where he directly refers to her drawings of Paris roofs, a traffic bollard, a bottle, and himself. 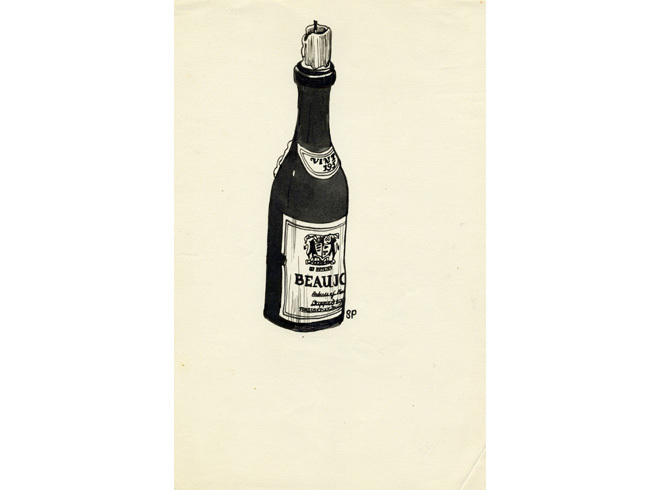 Sylvia Plath, Beaujolais bottle, 1956. Image via www.mayorgallery.com. Art features in Plath’s own poetry too and, in 1958, she wrote eight poems inspired by the works of her favourite artists, Klee, Rousseau and De Chirico. She admired, what she called, their primitive forms and was greatly motivated by their works. 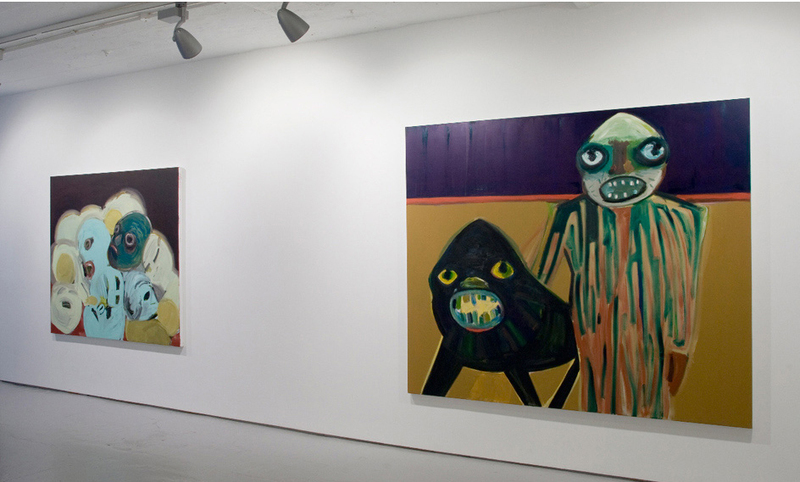 Plath described her imagination as visual and these paintings helped to spur her on. Sylvia Plath, The Bell Jar, 1963. Image via www.mayorgallery.com. Plath’s written work is often permeated with themes of death, redemption and resurrection. Here too, she uses details from everyday life as the raw material for her writing but transforms the mundane into actions charged with meaning, overwrought with images of rage, despair, love and vengeance. It is difficult to understand her work unless you understand her life. 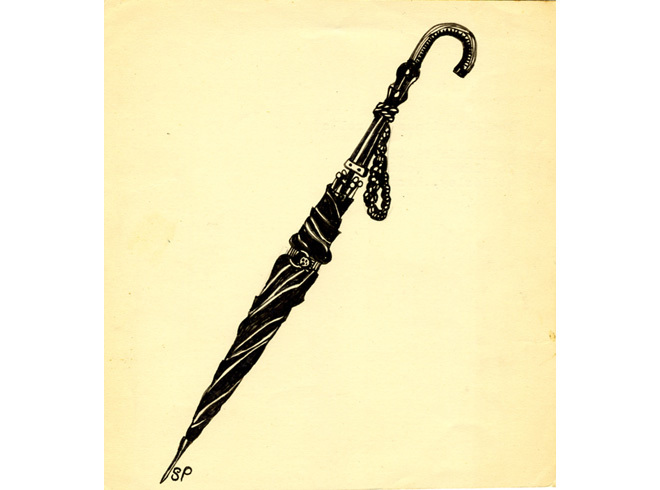 Sylvia Plath, The Ubiquitous Umbrella, 1955-56. Image via www.mayorgallery.com. 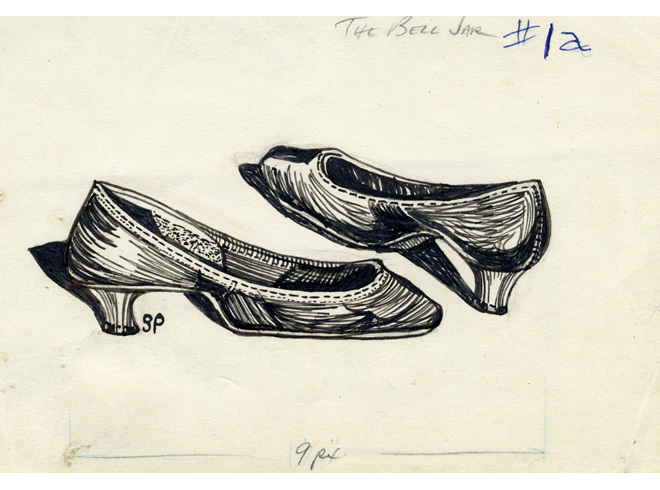 The main question here is would these drawings been so admired if they were not by Plath? I think probably not but I don’t think that matters. 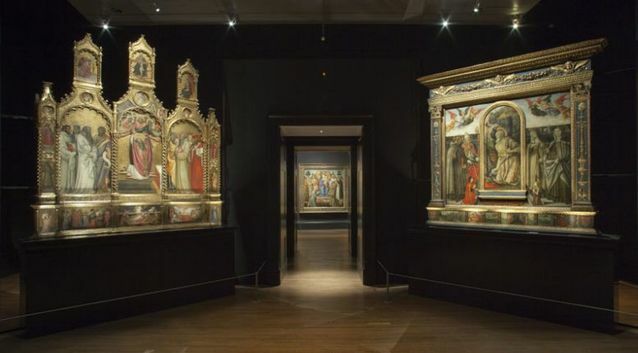 They are not outstanding works of art in their own right but, this aside, they are beautiful. This simple exhibition is well-curated, showing a range of gorgeous and life-affirming works – everything that we would not expect from Plath. Sylvia Plath: Her Drawings & Dadamaino: Volumes are at The Mayor Gallery until 16th December 2011, www.mayorgallery.com. This morning, I decided to visit the much-talked about Ambika P3 and it certainly didn’t disappoint. My first challenge was to find the actual space. It’s important to bear in mind that I’m not the most geographically savvy person but, luckily, google maps came to the rescue and I made it (although I did nearly wander off in the wrong direction – an occurrence that is becoming scarily regular, third time this week in fact, oh dear). For those without a compass at the ready, you’ll find the entrance hidden behind a red gate on the right hand side of Westminster University in Marylebone Road (opposite Madame Tussauds). It is here that the adventure begins and it certainly is an adventure, a magical mystery tour of sorts. Head down the metal staircase, past entrances to various warehouses and loading bays until a black door marks the entrance to this unique gallery space – the biggest in London. Originally the construction hall of Westminster’s Department of Engineering, Ambika P3 is now a 14,000 sq ft art gallery. Perfection! A sign in the lobby warns that it will take a while to adjust to the darkness but I still had no idea what to expect. 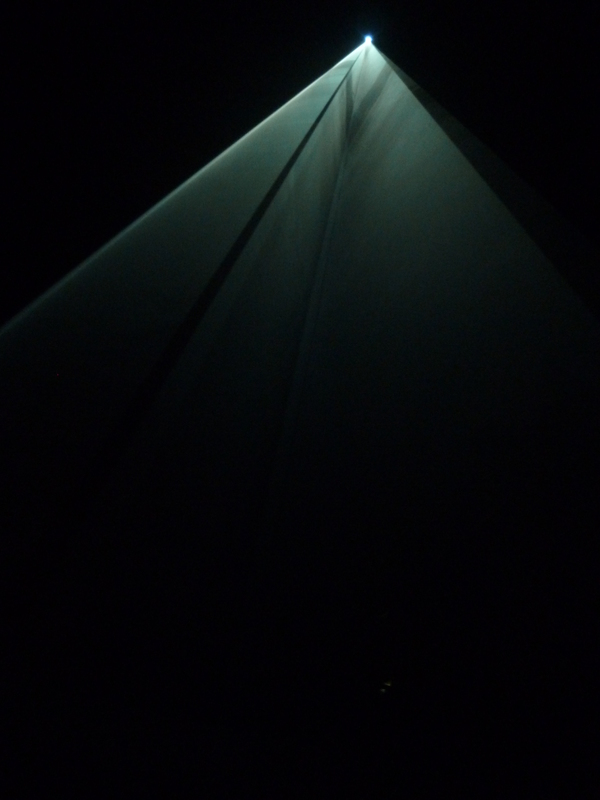 On first entering, you find yourself on a pitch black balcony which affords a wonderful view of all the Anthony McCall works on display. Convinced that I was going to fall Alice-in-Wonderland style to the lower level, I stumbled around as if blind (to the great amusement of the gallery assistant), arms outstretched until I reached the edge and could safely hold on. Once again, maybe those stilettos weren’t the best thing to wear to a dark art installation but I just can’t help it! After a few minutes my sight adjusted (and then the initial stumbling and groping seemed rather embarrassing) and I ventured down the staircase into the cathedral-like, cavernous space that houses the McCall light sculptures, Vertical Works, being shown in the UK for the first time. The works are a combination of cinema (the pieces are slowly moving), sculpture (3D works) and drawing (animated lines of light on the floor, housed in a room full of mist). The experience of walking through the actual sculptures was surreal. I approached the first work quite nervously, unsure of what to expect. I felt I was trying to pass through a solid form, a sheer waterfall of light. Hands once again outstretched, my fingers pushed through this invisible barrier and voilà… The feeling is amazing as you can, of course, walk straight through the shafts of light but, at the same time, you feel you are being transported to a new place as you cross through the works. Your whole body is affected by these giant monochrome installations. Light appears solid. It is intriguing to pause and watch other people interact with the works, also hesitating as they walk through the sculptures, expecting something to block their path. Visitors were lying down in the centre of the beams, becoming part of the works. I felt miles away from the hustle bustle of Baker Street as I lost myself in the light. 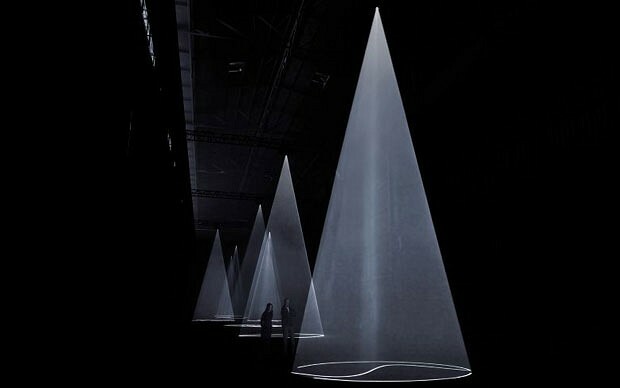 Vertical Works are created by projections from the ceiling which form 10-metre tall conical ‘tents’ of lights. The floor drawing acts as the footprint of the work with the 3D body of light rising and narrowing from its projection point. In simple terms (I’m an art historian, not a scientist), the sculptures are formed by light bouncing off the mist in the room. 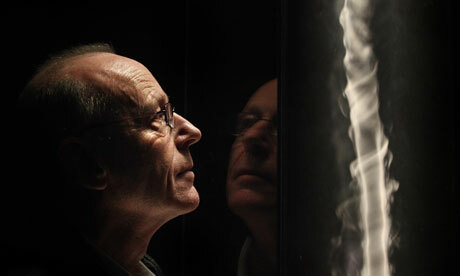 Folds of light create mesmerising shapes that are truly effective. 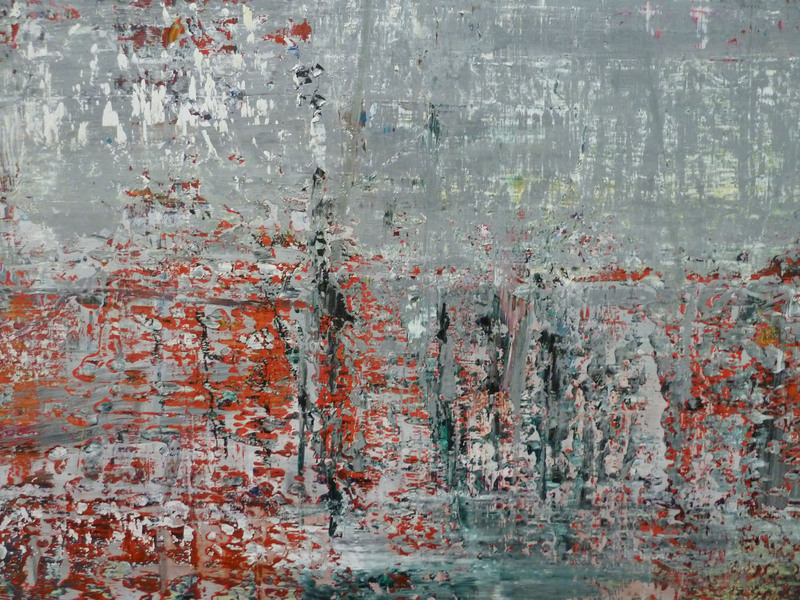 The supernatural effect gives the works a spiritual, other-worldly feel. They have been likened to shafts of light in a cathedral, yet there is something quite pagan about them as the simple white floor drawings are reminiscent of the chalk shapes you see on English cliffs. Unless you watch intently, you could miss the fact that the works are actually moving. Like you, they journey across the floor in a slow rhythmic pattern asking to be explored and offering visitors a sense of freedom as they become familiar with this adult’s playground. Both the space at Ambika P3 and the McCall works themselves are unbelievable . It’s a rare treat to experience something like as unique as this. 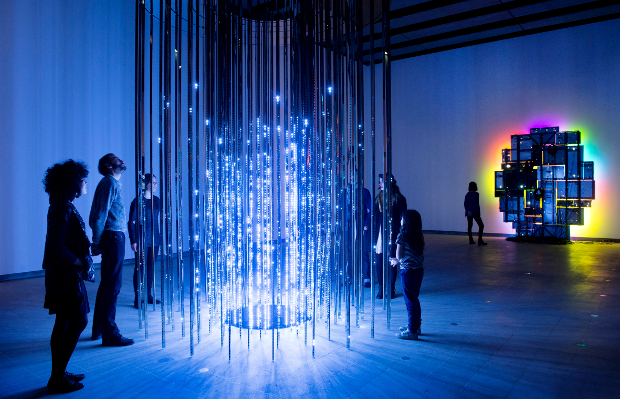 The installation is only on for one more week but do go and stumble around, journey through the room and move into McCall’s Narnia-like, parallel universe of light. McCall is also working on an Olympic commission: in Column a spinning column of cloud will rise magnificently from a dock in Merseyside. The work will respond to the weather around it, sometimes appearing as a white line against the bright blue sky, other times as a dark shadow when it’s overcast. 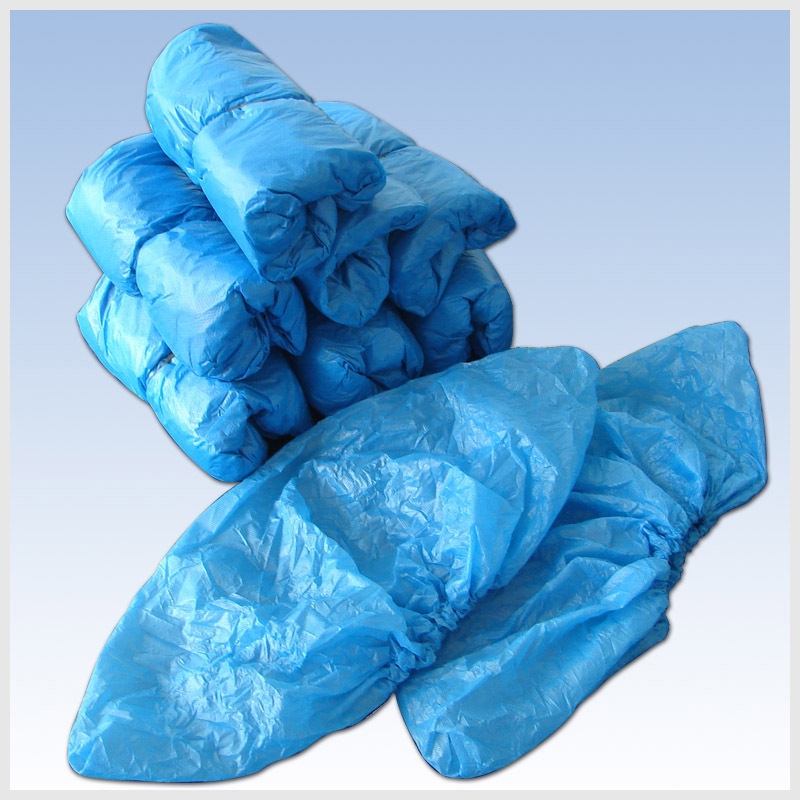 Approximately 20m in diameter, it will bend, disappear and re-appear. It will, no doubt, be another McCall work for us to fall in love with and I can’t wait! A sister exhibition of McCall’s drawings is on display at Sprüth Magers. 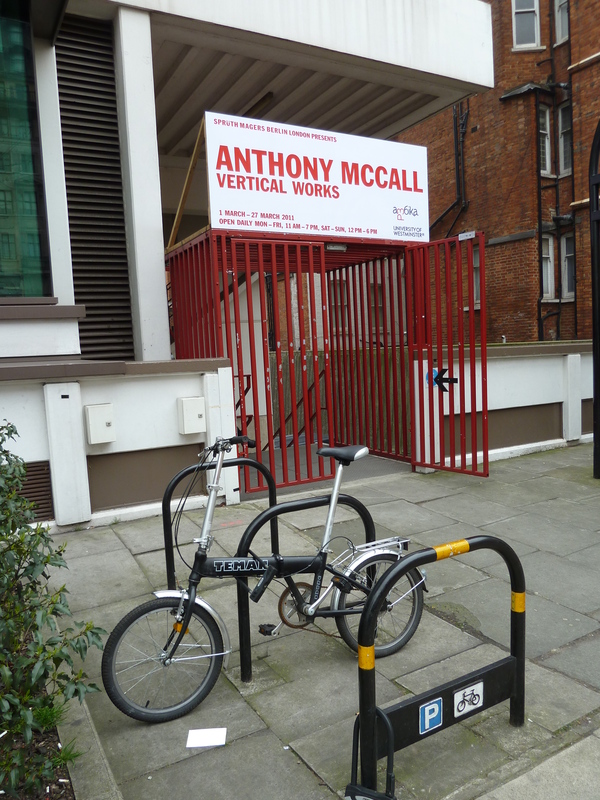 Vertical Works will remain in situ until 27th March at Ambika P3, University of Westminster, www.p3exhibitions.com.